Newkirk, OK (April 8, 2011) — After an action-packed night of fights at Bellator 39, former wrestling Olympian and current Bellator Welterweight World Champion Ben “Funky” Askren will take on former UFC and Strikeforce veteran Nick “The Goat” Thompson in a non-title superfight this Saturday, April 9th at the First Council Casino in Newkirk, Okla. at Bellator 40, which airs LIVE on MTV2. 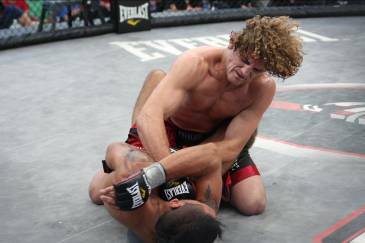 While “Funky’s” title isn’t on the line, Askren (7-0) isn’t going to treat this matchup any different than his title fight last season against former Bellator Champion Lyman Good. With the experience “The Goat” brings to the cage, Askren knows not to take the veteran lightly. Along with the Askren-Thompson superfight, Bellator 40 will see a Welterweight semifinal fight between Jay “The Thoroughbred” Hieron and fast-rising Brent Weedman for a coveted spot in the Bellator Welterweight Finals. In a Season 4 Lightweight semifinal fight, undefeated All-American Michael Chandler will step into the cage with Lloyd “Cupcake” Woodard as both unbeaten fighters will be looking to keep their spotless record intact. Tickets for Bellator 40 are on sale now at the First Council Casino Box Office and Ticketmaster. Ticketmaster customers may log onto ticketmaster.com; call Ticketmaster’s national toll free Charge by Phone number 1.800.745.3000; or visit any Ticketmaster outlet.